The man whose brainchild Serenity Park was, received recognition Wednesday evening during a ceremony to rename the facility. But he is clearly not happy that the park has been renamed. “I would like at this point to acknowledge the contribution of Mr. Richard Frederick, whose dedication to national service was the reason for the establishment of this park,” Castries Mayor, Peterson Francis, told the ceremony to rename the facility the Sir George William Mallet Serenity Park. But Frederick said during the HTS Evening News Wednesday that the renaming was an attempt to erase history. “In doing so, they want to totally obliterate the name Richard Frederick from the political landscape of this country,” the former Castries Central MP told HTS. Serenity Park, located in Sans Souci, Castries, was officially opened on May 15th 2011. Then Governor General Dame Pearlette Louisy, Richard Frederick, who was then a cabinet minister and Stephenson King, who was Prime Minister at the time, were among those present. 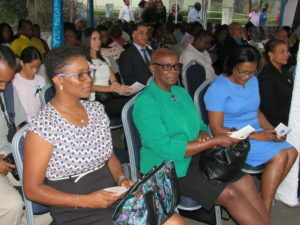 But Frederick was not present at the renaming ceremony on Wednesday at which Acting Prime Minister, Guy Joseph, other government ministers and members of the diplomatic corps were among those in attendance. It was reported that the former Castries Central MP was not invited. “The park is my brainchild. Sir George never represented Sans Souci. Why not Constitution Park where he represented?” Frederick asked. HTS reported that the former Castries Central MP was not opposed to the government recognising Sir George. Frederick said this was so for two reasons. He recalled that the park was named following an intense competition that attracted hundreds of entries from schools in Castries Central. Frederick told HTS that a committee decided who the winner of the competition was. Verlina Joseph of the R.C Boys’ Infant School, who eventually came up with the name ‘Serenity Park’ was publicly acknowledged by the Mayor of Castries during the renaming ceremony. Richard Frederick said the naming of the park had nothing to do with him. According to HTS News, the renaming of the park after Sir George Mallet would be short lived, if Richard Frederick has his way. “I am not too worried about that, but one thing is for sure, whatever plaque is placed here today, will be replaced by the former plaque,” the former MP asserted. There is a plaque there that clearly names Richard Frederick. Really don’t see the issue here. With the number of attacks on tourists and nationals at the park, I for one believe it should be shut down. What a shame!! Mallet my ***!! Richard you hurting ? tell us something,you were the designer of the park we all can agree with this.but we paid for the park it was built with our money right ? So you think you own the park ? Well,well ,well se la vie. But his name is there big and bold on the plaque. Whats the issue? This guy needs to chill. Richard, George, Peterson, Guy; i am not in the race, because i am not a politician. And you?